Pages and pages of wirey goodness! This book will lead you step by step through the skills you need to tackle advanced beginner and intermediate wire projects. It’s wonderfully organized so that each new skill builds upon the previous ones, making this book similar to actually taking a course in wirework. 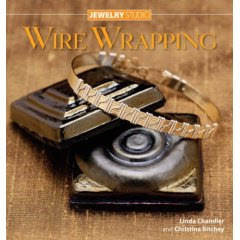 The fabulous writing team of Linda Chandler and Christine Ritchey have two other wire books already, a few years older, but still very worthwhile and still in print. 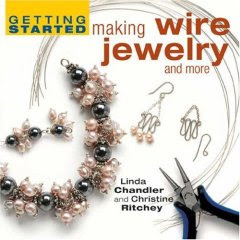 Getting Started Making Wire Jewelry and More is their beginner book. Beautifully photographed step by steps take you through all the basics. If you haven’t done much with wire, this is a great first book. The most advanced of all their books is Woven Wire Jewelry. 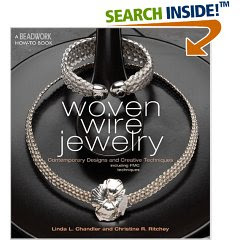 This book is amazing: it takes you from the basics of weaving with wire through making all different types of jewelry with the results. There is an advanced section on incorporating PMC into your wire projects as well. Some of the projects are simple enough for a determined beginner to accomplish; the rest will stretch your skills and leave you inspired to improve! This book presupposes that you already have basic wire and metal skills, so read the description carefully.